The powder puffs are like a cheater’s version of Russian teacakes. But enhanced with a chocolate kiss. 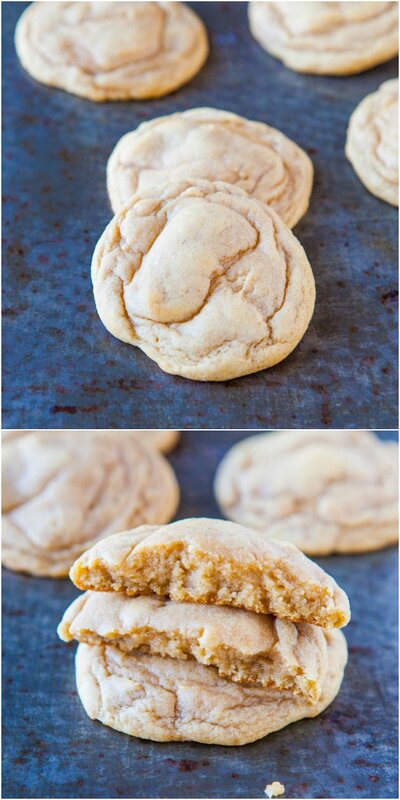 And you only need 3 ingredients to make them. Growing up it was an annual holiday baking tradition that my mom and grandma would bake Russian teacakes. They loved them, but of all the holiday treats they’d bake, teacakes were the last thing I’d reach for. In a sea of sprinkles, fudge, barks, and homemade caramels, they just couldn’t compete. Too boring. 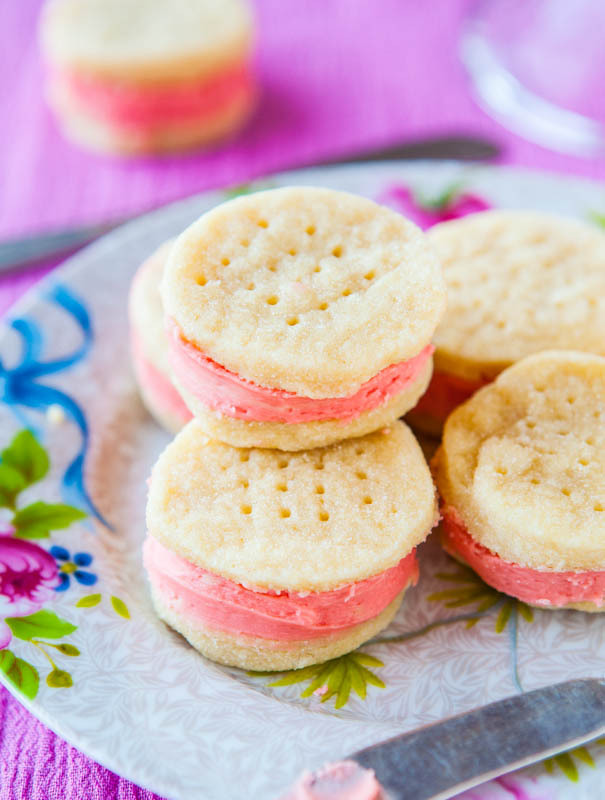 So I decided to re-vamp teacakes and made powder puffs, which turned out to be the easiest cookies ever. 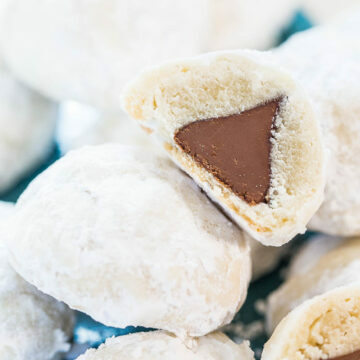 I sliced a sheet of store-bought pie crust into two-inch squares and placed a chocolate kiss in the center of each square before sealing the edges, patting into a mound, and baking. If you want to make your own pie crust, be my guest. I don’t. If you’re an avid pie crust make and find yourself with scraps, here’s a way to use them. For a twist, I mini peanut butter cups or Rolos would be tasty. After baking, I dredged the puffs through confectioners’ sugar, which I still call powdered sugar in my head. Cookbook editors say the proper term is confectioners’ sugar, but you can’t have powder puffs without powdered sugar. The contrast of the flaky, buttery pie crust with the dense, smooth chocolate interior is wonderful. The puffs are pretty small and it’s easy to pop quite a few. Whoops. Melt in your mouth, not in your hand. 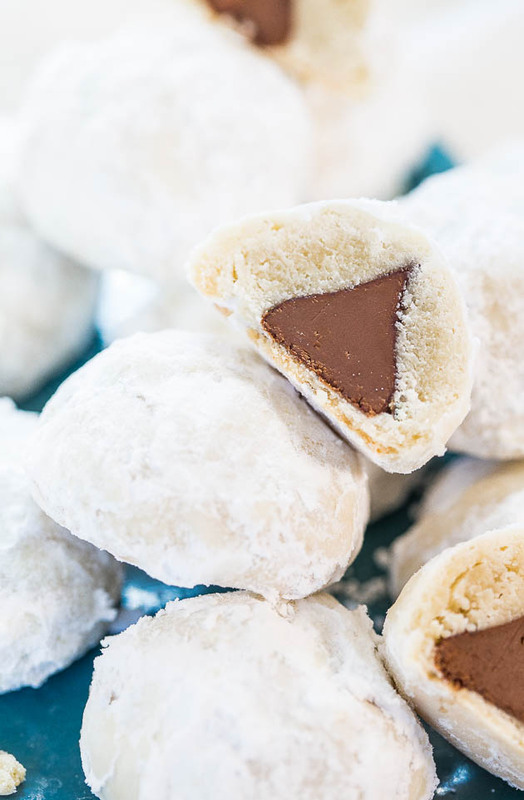 The powder puffs are like a cheater’s version of Russian teacakes, but enhanced with a chocolate kiss, and you’ll only need 3 ingredients to make them. The contrast of the flaky, buttery pie crust with the dense, smooth chocolate interior is wonderful. I used frozen pie crust but homemade may be used. 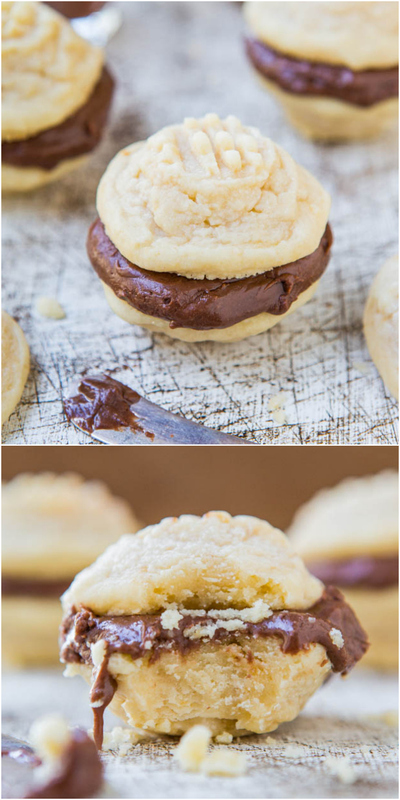 For a twist, try stuffing with mini peanut butter cups or Rolos. The puffs are pretty small and it’s easy to pop quite a few at a time. Melt in your mouth, not in your hand. Place pie crust on a lightly floured surface and using a pizza wheel, slice into approximately 16 sections, about 2-inch squares. Because the crust is likely a circle, if you make 4 rows of 4, a couple sections may be a bit skimpy so take crust from two skimpy sections and smoosh it together to make a section big enough to contain a Kiss. This is not an exact science, it’s okay if not all sections are exactly the same size. 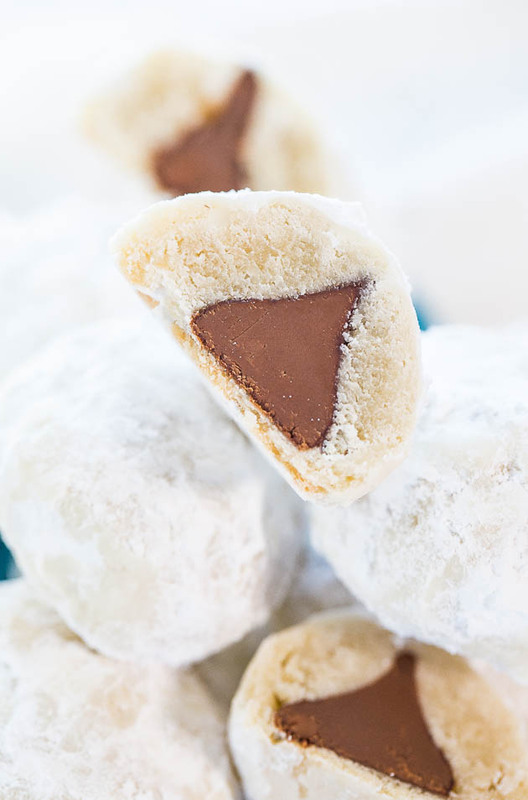 Using your fingertips, seal the dough at the top to fully contain the kiss. Pat smooth with your palms and flatten slightly into a mound. Place mound on prepared baking sheet; repeat with remaining crust sections and kisses until gone. Bake for about 15 to 17 minutes, or until crust is just set and done; puffs firm up as they cool. The tops will appear fairly pale while the undersides will be more golden; don’t overbake or the undersides could burn. Watch puffs closely starting at about 13 minutes since all ovens and ingredients vary. 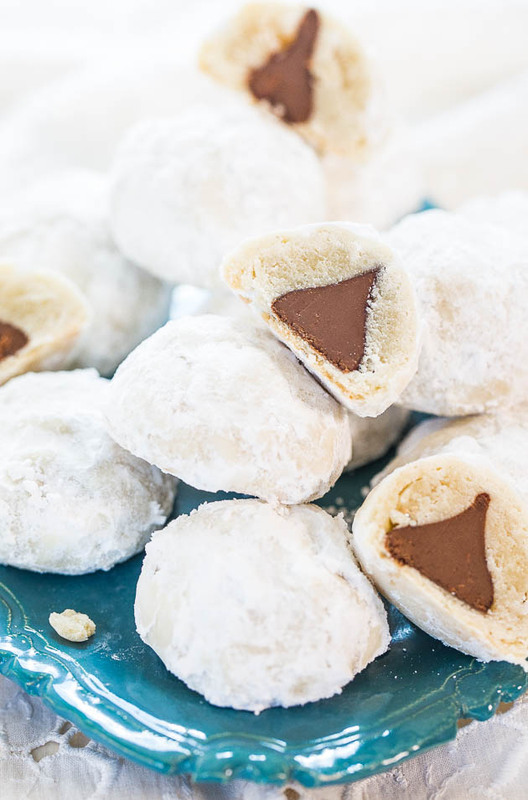 Allow puffs to cool on baking tray for about 15 minutes, or until cool enough to handle before dredging each puff liberally in confectioners’ sugar. Serve immediately. Puffs will keep airtight for up to 1 week at room temp or in the freezer for up to 4 months. They were delicious! I made a batch tonight, and my family loved them. What I did was cover the dough balls in melted butter and cinnamon sugar. Then of course, the powdered sugar! Very good, and cool idea! Thank you for sharing! Can you use almonds instead of walnuts? There are no nuts in this recipe as written. Why did my cookies Flatten Out? It’s really hard to say since I wasn’t there with you. Probably the pie crust you used and maybe it was really warm? Hard to troubleshoot from afar. Thanks for trying the recipe. I made these two ways. One with pie dough as directed and one with puff pastry. Both were really good and didn’t last long. Thanks for trying the recipe two different ways and I’m glad they both turned out well and that neither lasted long for you!